Magic Leap has taken $US2.3 billion and eight years to release its augmented reality headset goggles, and its founder Rony Abovitz says he is open to raising more capital. Abovitz told the Financial Times that Magic Leap is taking on tech giants like Apple, which is believed to be working on its own AR headset – and that requires cash. Magic Leap’s headset, the Magic Leap One, tries to replace screens like the TV and smartphone by overlaying objects onto the real world. Magic Leap has raised $US2.3 billion (£1.8 billion) to date for its augmented reality goggles, but its CEO and founder Rony Abovitz said the company is open to taking a further slug of cash. Abovitz didn’t name names, but the “biggest companies” likely includes Apple, which is thought to be working on its own augmented reality headset. And compared to Apple, Magic Leap is a minnow in terms of resources. Magic Leap has generated huge amounts of hype and venture capital for its augmented reality system, which comprises its smart glasses and an accompanying, circular computer which clips onto the wearer’s belt. The idea is that the wearer can overlay things that normally require a screen – like their emails – over the real world. 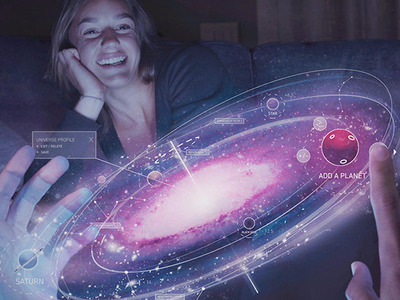 Magic LeapThe Magic Leap headset promises to overlay 3D virtual objects over the real world. It has taken eight years for the headset to come to market, with Magic Leap announcing the first batch available for pre-order on Wednesday for $US2,295 (£1,799). That money would buy you two iPhone X phones, with some change to spare. Initial reviews were mixed, with some suggesting the headset didn’t mark a major step forward in augmented reality.